Guess who's not celebrating Christmas this year? Millions of people all over the United States. That's right. Tens of millions of Americans don't celebrate Christmas religiously, either as followers of non-Christian religions (Buddhists, Muslims, Hindus, and Jews—among others) or as individuals with no religious affiliation, possibly atheists or agnostics. Because many stores tap into the cash value of Christmas with their plethora of Santas, ornaments, and Christmas fanfare at your nearby mall, you can easily overlook the depth of the diversity present in America during this holiday season. In reality, many different events, both spiritual, religious, and tradition-based, are celebrated in many different ways during these times. Acting inclusively used to mean sending out politically correct "Happy Holidays" greeting cards and changing Christmas office parties to "holiday parties." Today, celebrating inclusiveness and diversity is about more than just changing labels and titles. Celebrating diversity and inclusiveness is about using the holiday celebration time with friends and family to build understanding and awareness of the traditions and beliefs of others. Below are some noteworthy approaches. Carve out some time from online shopping or a holiday TV show to learn about another culture's celebrations during this time. Watch a TV special about other celebrations, do a Google search on a holiday, or check out books at your local bookstore while gift shopping. Share your learning with others, and use it as a chance to expand the conversation at parties and at the dinner table. Realize that people celebrate a variety of holidays during this time of year, and some people choose to celebrate none. Be respectful of these differences by taking an interest in other people's traditions and making them feel welcome. Don't be afraid to ask people what holidays they celebrate. You can also find out what they do during this time of the year that is special. Let it be an opportunity to learn about different cultures and religions and the traditions that accompany them. If the calendar you use does not list holidays like Kwanzaa, Hanukkah, Ramadan, and Diwali, find out the dates and record them as reminders. Many programs like Microsoft Outlook allow users to add calendar dates for celebrations from different parts of the world automatically, making this task quick and effortless. Take a few minutes to mark your address book with the holidays that people celebrate. When writing holiday cards, recognize their holiday, and include a short handwritten note acknowledging their celebration. Want to become more inclusive so that your employees feel included and respected in your workplace? You can do much in your workplace to reinforce the fact that all voices are welcome and have an impact on decisions and plans. Make sure that your employees understand that you believe that divergent voices make for a better, more productive, beneficial work environment. Make sure that your holiday party isn't a Christmas party in disguise. Make the decorations and food general and not specific to any religion. Consider having a New Year's party instead of a holiday party. This type of party can get everyone on board with the company's mission and vision for the New Year. 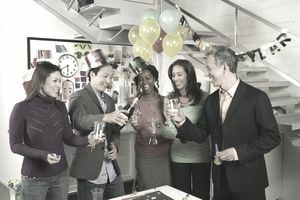 Some companies elect to skip holiday parties and hold a party during the company's birthday month or during a less busy time of the year so that more employees and their spouses and partners are able to attend. Post your holiday greetings on your webpage and intranet for many religious holidays. Practice respect for these special dates and plan events and meetings around various religious holidays. Don't serve a holiday luncheon on the day when some employees may be fasting for Ramadan. Serve vegetarian options at the company hot dog lunch and for that matter, whenever the company orders and serves food. Display a multi-cultural calendar to help all employees stay aware of important cultural events for the rest of the year. Treat the needs of different employees about religious or holiday celebrations with flexibility. Consider offering floating holidays as part of your paid holiday schedule. Encourage employees to share their celebrations through stories, decorations, and foods that they can bring to their workplace. In one workplace, to celebrate his Polish heritage, an employee brings Pączkis to work on Fat Tuesday, also known as Shrove Tuesday or Mardi Gras, the day to indulge before Lent begins. Simma is a Diversity and Inclusion/Culture Change Consultant. She has worked for organizations including McDonald's, Oracle and U.C. Berkeley. Her articles have been featured on The Wall Street Journal, NY Times, Fast Company, The Economist, Forbes, Black MBA, Restaurant Hospitality Magazine, Insight Into Diversity, Working Mother, Cosmopolitan UK, Human Resource Executive, CEO Refresher and CNN.